This Case History cover cleaning systems built for batch cleaning of engine components. The process objective is to fully remove dirt, grease and oil from outside and inside engine blocks, heads, and engine components. The Wash/Rinse system below is designed for batch loads of a wide variety of sizes and configurations (up to 68″ long x 36″ wide with maximum gross weight of 2000 pounds). 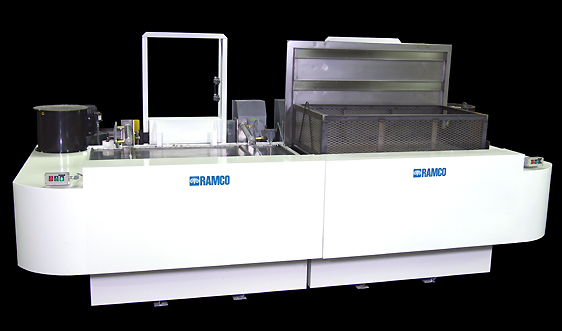 The heart of each RAMCO system is the adroit use of an elevator within each processing chamber. The elevator is used to transport components into and out of each chamber. However, its most important function is to position and continuously move components within the working zone during the process. 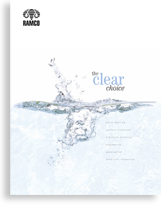 It is this dynamic aspect of its function that allows RAMCO systems to achieve superior results in washing, rinsing and drying. We call this Dynamic Flow Combination. Dynamic Flow creates better coverage of surfaces, minimizing standing waves and/or part shadowing, produces more consistent results, and accelerates processing times. The next system, shown below, consists of two Washing stations with a centrally located oil removal system. 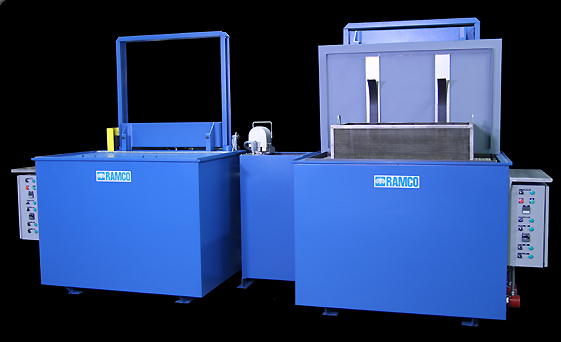 RAMCO SurfaceSweep features are installed in both tanks. 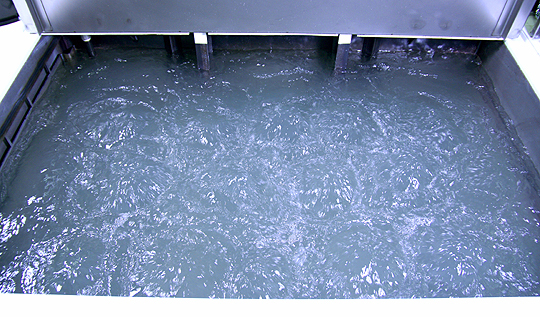 Oil that rises to the surface is routed to the central holding tank where it is removed using a stainless steel belt skimmer. To handle the wide assortment of sizes, shapes, and configurations of engine parts a comprehensive dynamic flow package was designed and installed into the Wash and Rinse Stages. Platform oscillation, directional turbulence with turbo jets, oil removal with SurfaceSweep (to prevent floating oil from redepositing onto cleaned parts), and large capacity filtration was incorporated into the automatic process cycle. Other features included Nema 12 panels with lockout-tagout disconnect, platform roller conveyors to facilitate transfer between stages, and lip vent exhaust systems.